Finally the instructions and the English translation are finished – here it is, my Spring Plumage! 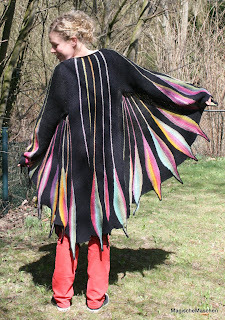 “Spring Plumage“ is a long A-Line cardigan to fit over long tunics. It is constructed with elements of Nadita’s DREAMBIRD, but it is an independent design. 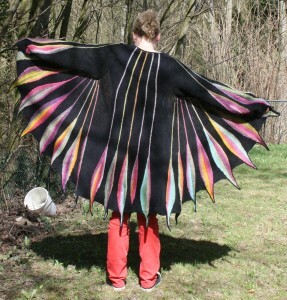 The decorative feathers and the construction based on triangles were inspired by the DREAMBIRD, and if you already have done this beautiful shawl this will help you with my Spring Plumage. I changed the feather element in a few places – The difference to the Dreambird will be explained in the instructions for the feather. Knitting a cardigan is very different to knitting a shawl. Therefore I had to change the triangle parts of the DREAMBIRD completely. They are different for the different parts of the cardigan. The differences will be explained in the individual sections. The cardigan will be knitted in one part seamlessly. Even the sleeves are directly added without a seam. There is only one grafted seam which closes each sleeve with Kitchener Stitch. The pattern instructions are made for yarn with a gauge of 18 stitches/ 18 double rows for 10 x 10 cm (4×4 in) in garter stitch. You can easily use different yarns with a different gauge. You can try on the Spring Plumage with every step of the instruction, so you can easily see which size you’ll have to follow to make the plumage fit your size. Spring Plumage has a kind of raglan design and a swinging A-line shape. This makes the cardigan very adaptable to your body shape. My cardigan size L fits perfectly in the shoulder from size 38 to 48 (US 8 to 18). The various sizes differ only in how much the front sections overlap: with the smaller sizes they overlap a lot, with the larger ones they build a type of V-neck. My warmest THANK YOU to all who helped me getting this pattern instruction completed! Orla for her help with the English translation.